Trying out a detox diet? Follow these guidelines to get the most out of the process. Prep for the process. Most cleanses encourage you to wean off caffeine, alcohol, soda, processed foods, salt, sugar, dairy, gluten and animal products (like meat, eggs or dairy) and bump up your vegetable and fruit intake a few days prior. "Preparing for your cleanse, both mentally and physically, helps you adhere to the program," notes Isabel Smith, RD, a New York City-based registered dietitian. Stock up on straws. Sugars and acids in juices can damage your tooth enamel, cautions Joseph Banker, DMD, member of the American Academy of Cosmetic Dentistry. Drinking through a straw directs liquid away from the teeth. Don&apos;t skimp on sleep. Make sure you&apos;re getting the sleep you need; seven to eight hours helps your body restore itself and boost immune function to take full advantage of all the nutrients you&apos;re providing it with, says Smith. Exercise light(er). "Since your body does not have the endurance to repair itself during this time, you might want to go easy," says Ronald Hoffman, MD, who specializes in nutrition and alternative medicine at The Hoffman Center in New York City. If you're already working out, it's generally safe to continue; you might also consider substituting gentle exercises like yoga, Pilates, barre, walking or swimming. Book some bodywork. Massage, professionals concur, is a great way to push toxins through your system during a cleanse. Another method, dry brushing (done with a long-handled natural bristle brush), sloughs away dead skin cells and opens pores for the elimination of toxins, cleansing connoisseurs say. Transition back into eating. 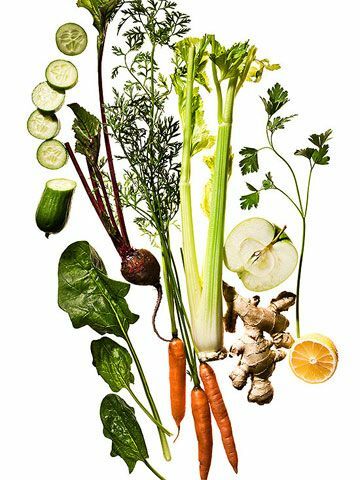 After a cleanse, the body is not used to assimilating large amounts of nutrients quickly and it can be a shock to the system, says Hoffman. On the last night of your diet, eat a small salad. Then ease back into eating over two to three days with smaller portions of wholesome foods like brown rice or quinoa, steamed veggies and lean meats or other proteins.